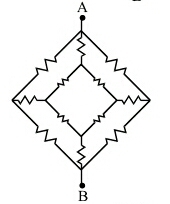 The figure shows a network of resistor each heaving value 12. Find the equivalent resistance between points A and B.
I could not understand how to solve this problem . But after seeing the answer I noticed that , they have assumed these points at asame potential and neglected the resistance between them . I could not understand how they can be at same potential . The answer in your book is correct. The potential at each of the 4 circled nodes in your diagram (nodes D, E, F, G in the leftmost figure of my diagram below) is $\frac12(V_A+V_B)$. This is because the resistances along the paths AD=DB, ACE=EHB, ACF=FHB, and AG=GB. Since these nodes are at the same potential, no current flows through DE or FG. 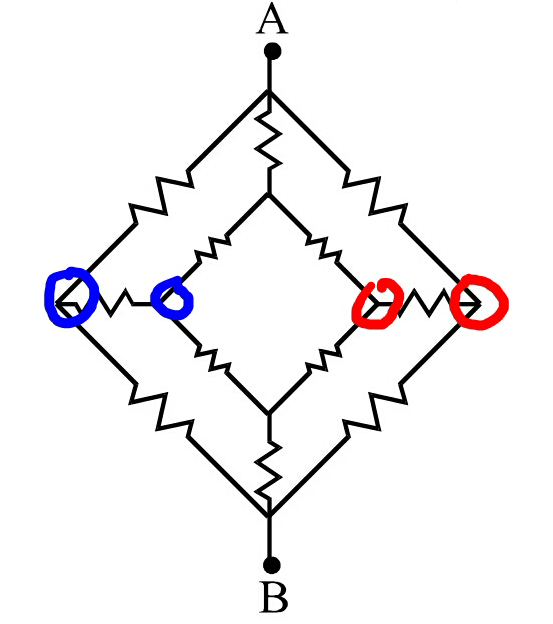 These links could be cut without making any difference to the resistance of the circuit (see middle figure below). Resistances CEH and CFH are in parallel and each is 24$\Omega$, so they can be replaced by one resistor CH of 12$\Omega$ (see rightmost figure). You are left with 3 parallel combinations of resistors, ADB and AGB each of 24$\Omega$ and ACHB of 36$\Omega$. The equivalent resistance is 9$\Omega$.